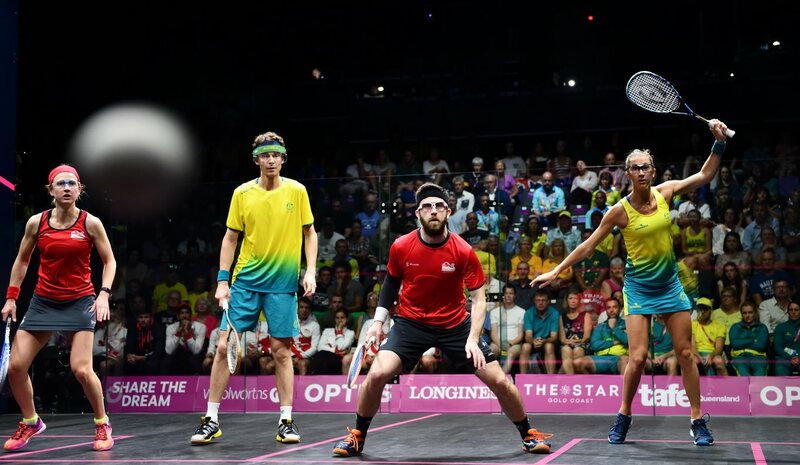 India and hosts Australia will go head-to-head in a surprise Commonwealth Games Squash Mixed Doubles final after the top two seeds failed to survive today’s three-game semi-finals at Oxenford Studios in Gold Coast, Australia. 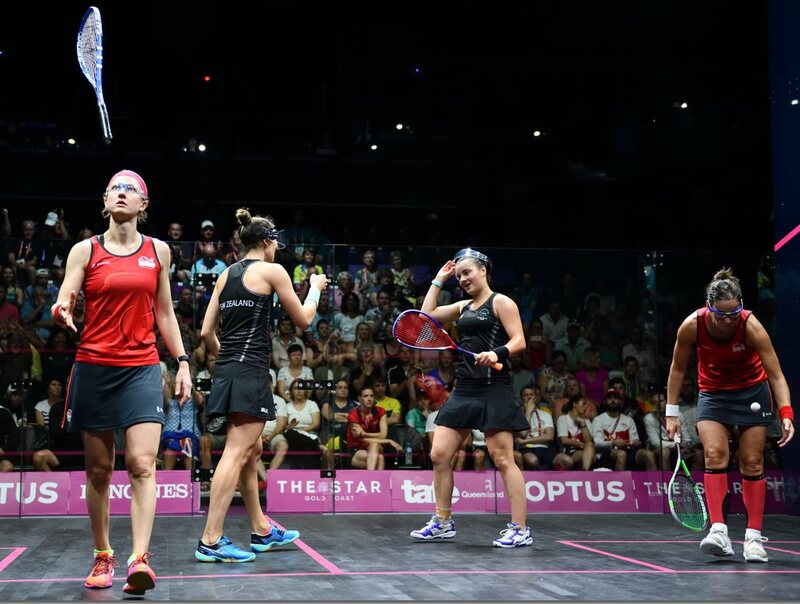 It was the end of the line for the favourites when Dipika Pallikal Karthik & Saurav Ghosal, the fifth seeds from India, defeated New Zealanders Joelle King & Paul Coll, the reigning world champions, 9-11, 11-8, 11-10 in 53 minutes. From 6-3 down in the third and final game, the Kiwis came back to take a 7-6 lead before India moved on to match-ball at 10-9. King & Coll grabbed the next point to force a sudden death 10-10 ‘match-ball’ for both pairs – but after a lengthy rally, King hit the ball into the tin to put Pallikal and Ghosal into the final. Speaking of his partner and sister-in-law, Ghosal continued: “Dipika was immense tonight, she did so well. She dictated the forehand side of the court more than Joelle did. She was moving well and picked up some great balls – she was brilliant. “It’s about winning a medal for India – and that’s we work for. We take a lot of pride in playing for our country. It’s not about money or fame – it’s about contributing to that medal table. 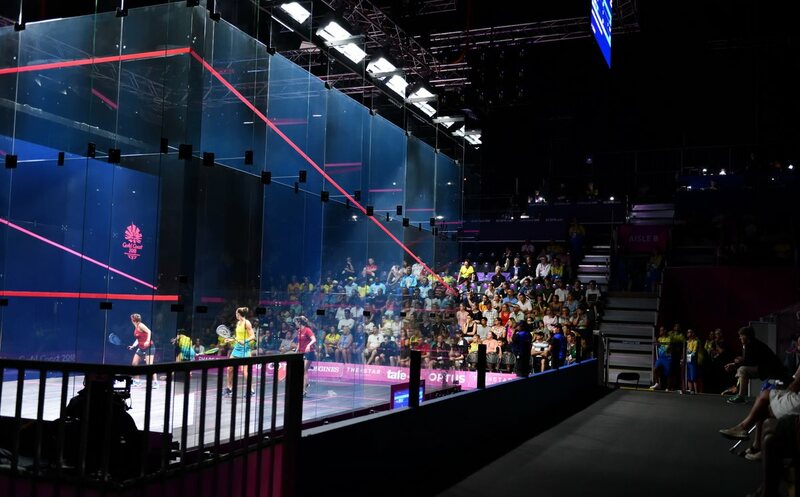 The second semi immediately followed on the all-glass showcourt – with the capacity crowd eager to cheer on a home pair. Undoubtedly buoyed by the crowd, Donna Urquhart & Cameron Pilley recovered from the loss of the first game to beat Alison Waters & Daryl Selby, the No.2 seeds from England, 10-11, 11-7, 11-7 in 55 minutes. Fellow Yamba-born Urquhart, his first cousin who earlier also came through a Women’s Doubles quarter-final clash, added: “The atmosphere tonight was as good as it was this morning – and it’s nice when you can give them something to cheer about. There were a couple of thousand people here. We didn’t want to let them down. It was in the morning that Urquhart teamed up with Rachael Grinham to survive one of the most dramatic squash matches ever seen in the Commonwealth Games. The fourth seeds looked dead and buried when Welsh pair Tesni Evans & Deon Saffery, the No.6 seeds, took the first game and built up a 9-1 lead in the second – just one point shy of match-ball. But, with the partisan crowd behind them, Grinham and Urquhart stuck to the task and reduced the deficit point by point before drawing level after a sudden death 10-all tie-break. With the stuffing knocked out of the Welsh, the Aussie pair motored on to take the third to win 9-11, 11-10, 11-3 – much to the overjoyed delight of the crowd. On the impact of the crowd, Urquhart said: “At 9-1 down they were really quiet and with every point we got back they got louder and louder! Another earlier match saw a different outcome between Pilley and Selby. 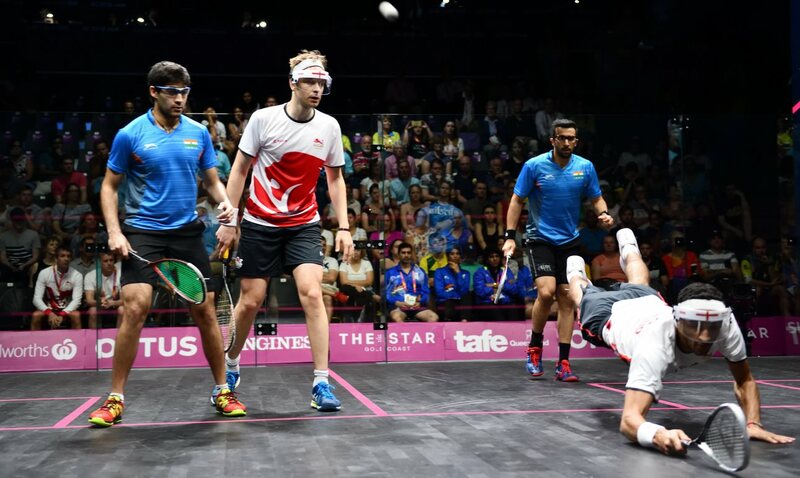 It was a quarter-final match in the Men’s Doubles when Pilley & Ryan Cuskelly, the top seeds and reigning world champions, faced English outsiders Daryl Selby & Adrian Waller, the 7th seeds. The Aussie pair, widely considered one of the hosts’ best gold medal hopes, failed to capitalise on a first game lead and allowed Selby and Waller to clinch a massive 9-11, 11-8, 11-10 triumph in 73 minutes. The match followed another English win, by Declan James & James Willstrop who now face compatriots Selby and Waller for a place in the final. “What can I say, my partner was phenomenal – he had a lot of balls to hit today,” said Selby. “It’s his first Commonwealth Games and he played phenomenally well. I was lucky enough to hit the winning shot but Waller was absolutely brilliant. “As I said yesterday, as a pair, we’re dangerous – but these boys are world champions and they’re world champions for a reason: they’re the best doubles pair, and they have been for a long time. A win over them, in Australia, is something very special. “And it guarantees some medals for Team England! Waller, who departed from the Mixed doubles the evening before after a defeat by Selby and his mixed partner – again 11-10 in the decider – added: “Yesterday was brutal for the whole team – no-one wanted to watch, everyone was on the edge of their seats. There were really no winners out of that – because everyone put their heart and soul into it. “But we backed up well afterwards – last night Daryl and I played really well and I think we took the took the confidence from that into today’s match. They’re a solid pair and didn’t give us much at all. To get through on sudden death …… I didn’t want to lose two in a row – that would have been too much! An unusual quarter-final fixture in the Women’s Doubles saw top seeds Joelle King & Amanda Landers-Murphy, representing New Zealand, take on English pair Jenny Duncalf & Alison Waters, the second seeds. The Kiwis, paired with the No.2 seeds after failing to win their qualifying pool group, made it clear that they are fully back on track after dismissing their English rivals 11-10, 11-5.